Who knows? Maybe chess was ‘invented’ in China afterall, as the article below mentions. But what is undisputable is that in China today the game of chess is growing in popularity and importance, in parallel to the growing economy. Some of the best young grandmasters in the world today are from China. The current female World Champion is a chinese teenager! Many believe that it will not be long before the absolute World Champion will hail from China. China joined FIDE only in 1975, participating for the first time at the Olympiad in 1978 at Buenos Aires. By way of comparison, Canada was a founding member of FIDE (1924). 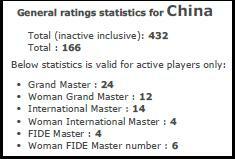 Progress was fast and today China is ranked 4th in the world amongst all nations, with 36 active grandmasters (male and female). The chinese men grandmasters, however, still have some work to do before overtaking the Russian men grandmasters in statistics department. But already positive signs are appearing. 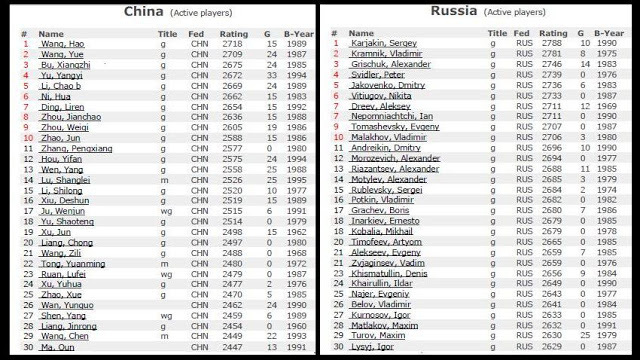 For example, the top Chinese players are younger than their Russian counterparts. I count 4 of the top 15 chinese players born since 1990, whereas only 1 of the top 30(!) Russian players is born after 1990. And please take into account that the current top active Russian GM is actually from the Ukraine! AND WHAT ABOUT THE TOP WOMEN? I think that already the Chinese women have taken a slight lead over their Russian counterparts! Likely in 5 years time that lead will have been increased. As a crystallization of wisdom, the chess culture is a legacy of traditional Chinese arts, and has contained many rich values and profound cultural significance throughout the ages. Together with playing musical instruments, reading, and painting, playing chess was considered as one of the essential qualities for ancient Chinese literati. Among the wealth of different kinds of chesses, many were invented in China like Chinese chess (Xiangqi), and go (Weiqi). Some people even argue that international chess itself also originated from China. With a long history, Chinese chess experienced seven stages of development: burgeoning, growing, contending, upsurge, declining, prospering, and steady periods. There are many stories about the origin of Chinese chess. Some believe that it was invented by Shennongshi, a legendary god of farming; others insist that the game emanated from the Warring States Period (475-221BC); while yet some think that the game was first formed in the Northern Zhou Dynasty (557-581). However, the most widespread story about the origin of Chinese chess goes that Emperor Shun invented the game to educate his younger brother Xiang, hence the name of Xiangqi. As a traditional form of art, the game of go also boasts a number of legends about its origin. One of the best known is that when Emperor Yao married Fuyi Shi and had a son named Zhu, Yao became very disheartened when the son did not behave well. So Yao made the game of go to cultivate him morally and intellectually. Meanwhile, some believe a political strategist in the Warring States Period (475-221BC) created it. Nevertheless, despite the legends, the fact is that the primitive form of the game of go appeared in the primitive society, and the game was a collective, rather than an individual, creation from ancient China. The game of go is usually closely associated with military affairs because both attach great importance on strategies and moving forces. Chinese chess also has this characteristic. While a lot of people believe that international chess was invented in India, some still hold the idea that the game was a creation of ancient Chinese. However, there is no substantial difference between international chess and Chinese chess. Influenced by different histories and geographies, the two games have varied ways in moving the chess pieces, representing different cultural backgrounds and characteristics. Today, people all across China love various chesses, which are a prevailing form of entertainment. The games are highly competitive and require much brain activity, which could be good therapy for the intellectually retarded people. However, playing chess is more than only a sport in China; it is also a kind of widespread art form. READ Thursday...with a little bit of attitude, please! Tony Miles: 11 years on!